Aranda Girls. Australian Aborigines Friends’ Association, 1936. I was pleased that Wazza Jones blogged on Tuesday about the impact of intergenerational trauma on his family. His statement was deeply moving. The Healing Foundation film, made for the Foundation for Indigenous Sustainable Health, was well done and impactful. If you haven’t visited already, please check out Wazza’s blog posting. Thank you, Wazza. 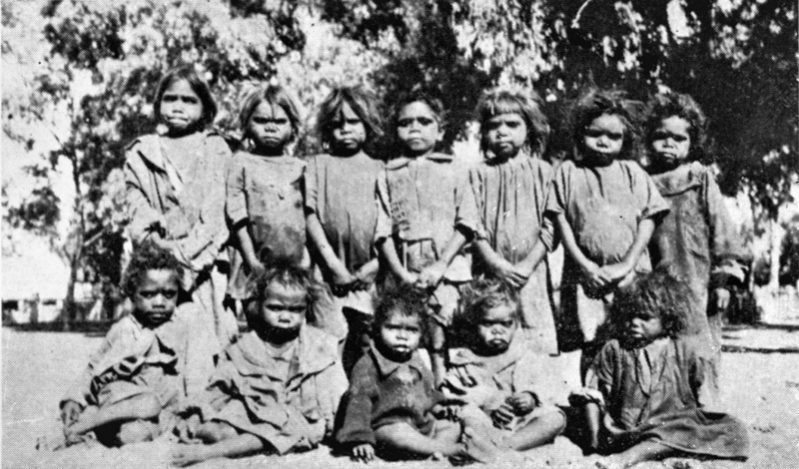 Intergenerational, or historical, trauma amongst Aboriginal peoples is the trauma that has arisen as a result of the historical experiences of colonisation (and associated violence and control), forcible removal of children, and loss of culture. As it was not addressed at the time, this trauma (and associated grief) have been passed down unwittingly through the generations by peoples’ behaviours and thought patterns. Intergenerational trauma has impacted upon Indigenous of other countries (e.g. Canada, United States and New Zealand) colonised by Europeans. I would just like to remind people that you can find two postings I wrote earlier about intergenerational trauma in the Healing Blog. The first posting, entitled Historical Trauma, introduces the concept. The second, The Impact of Colonisation, looks at various elements of the colonisation process and how they helped generate trauma that has passed down the generations. an education initiative to help Indigenous peoples heal from historical trauma and its consequences (e.g. mental health problems, addiction), as well as the impact of other adversities, e.g. social and economic disadvantage, experiences of paternalism and racism, and ongoing grief. You will find a section devoted to Trauma, as well as another devoted to Healing. There are also Stories and Culture sections, as well as my Blog. I have been working so hard on The Carrolup Story I’ve not had much time to blog on Sharing Culture recently. However, there are plenty of blog postings on the website. I’d like to leave you with the first of three films focused on a talk about intergenerational trauma and healing by Canadian Joe Solanto. Each of these films are worth watching. The second film clip can be found here and the third here. Dr. Solanto discusses what trauma is, how the experiences of colonization “qualify” as trauma, how trauma might be transmitted across the generations, crime and other social problems as understandable responses to trauma and implications for healing individuals, families and communities.